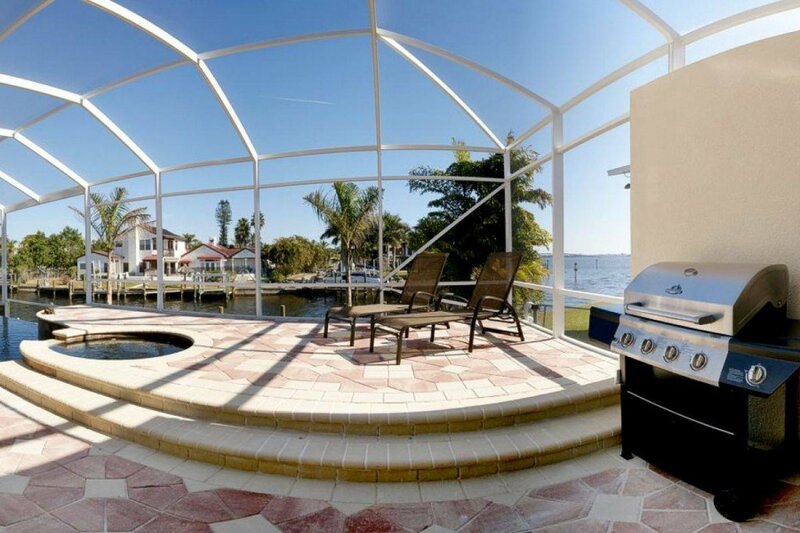 This upscale vacation home is located almost directly on the Caloosahatchee River, which allows quick boating access to the Gulf of Mexico. 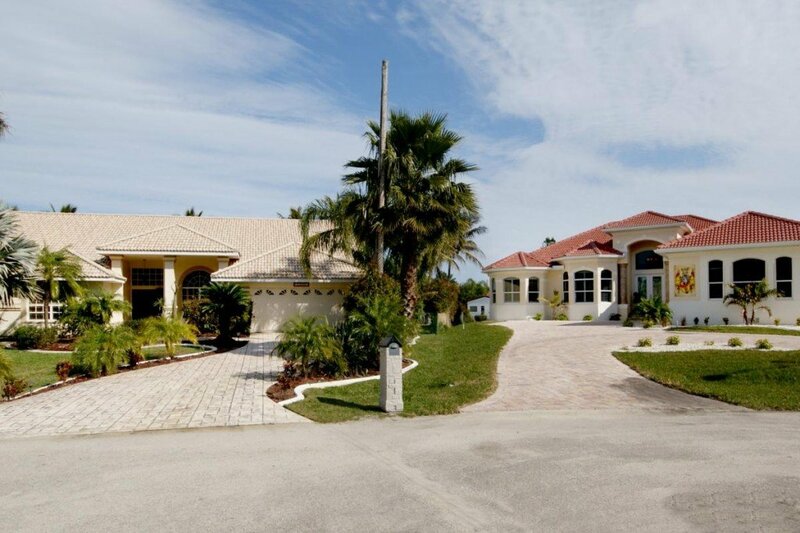 The lot itself is over 20,000 SF in size and the home has a living area of over 2,200 SF. 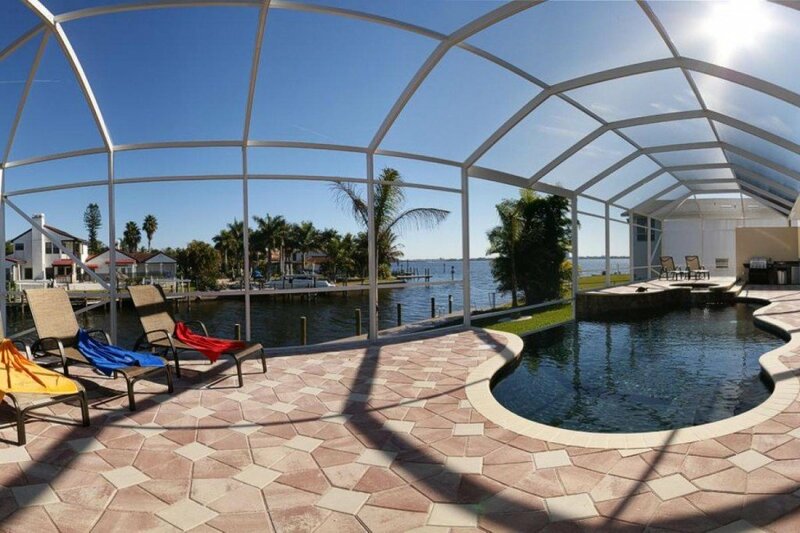 The outstanding location makes this property a true boater’s dream. 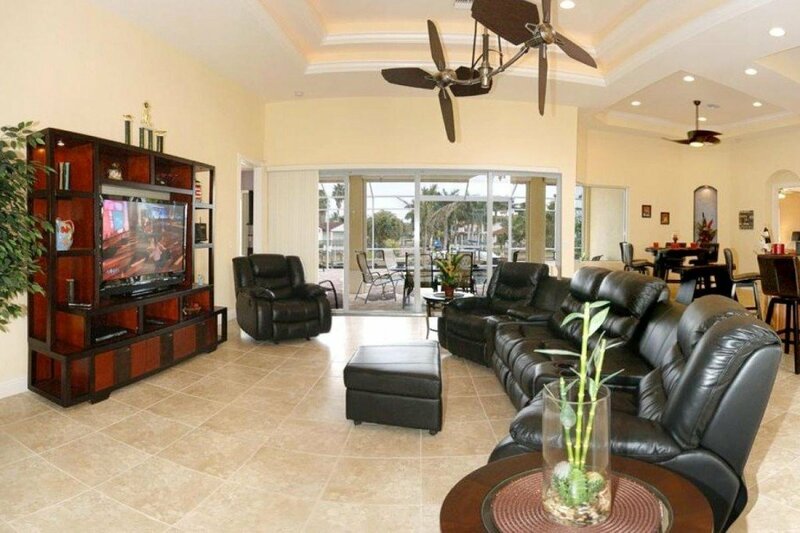 Villa Riverview offers everything you need for an entertaining, yet relaxing vacation. Guests will immediately feel right at home. Situated at the cul-de-sac end of Nautilus Drive, the location is not only very quiet but also conveniently close to Villa Nautilus. Both homes are separated by a small private playground (with monkey bars, swing set and slide), which young guests will particularly appreciate. Both homes can be rented together. With altogether 8 bedrooms and 7 baths, they offer space for up to 16 people. In the vicinity are the tennis courts at the Yacht Club and the lovely beach on the Caloosahatchee River. Stores and restaurants are close by, and it takes about 25 minutes by car to reach the Miromar Outlet Mall. Other attractions are only a short drive away as well. 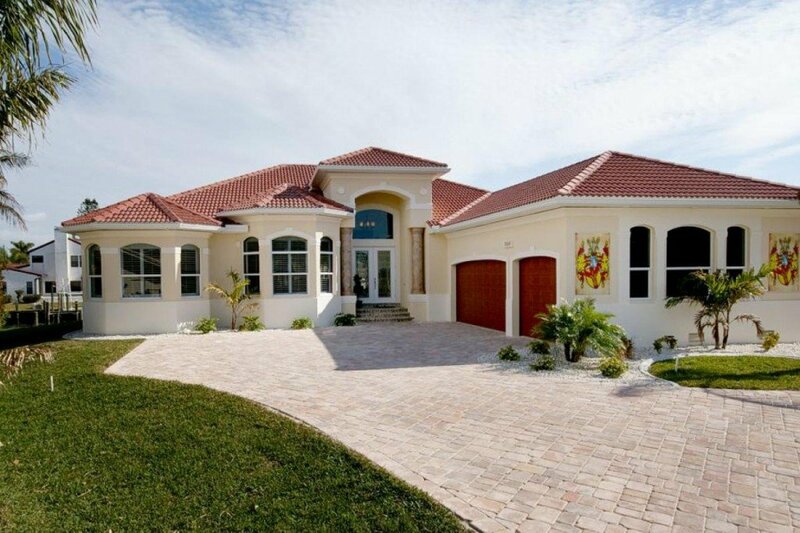 The impressive entry with its soaring columns hints at the luxury that guests of Villa Riverview can expect inside. The home offers four bedrooms, each with a TV and an adjoining bathroom, including two master suites that open to the patio. Bedroom 1 features a King size bed and a small writing desk. 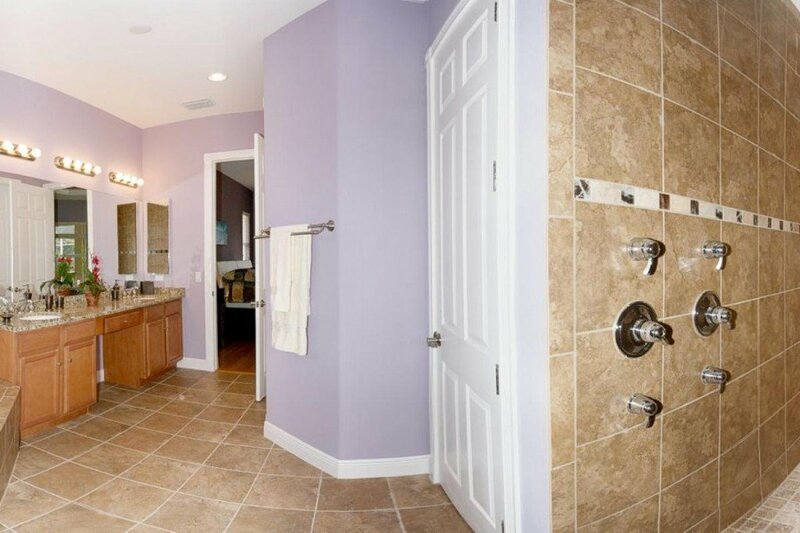 The en-suite bathroom consists of a large walk-in shower with five shower heads, a separate tub and a spacious sink area. 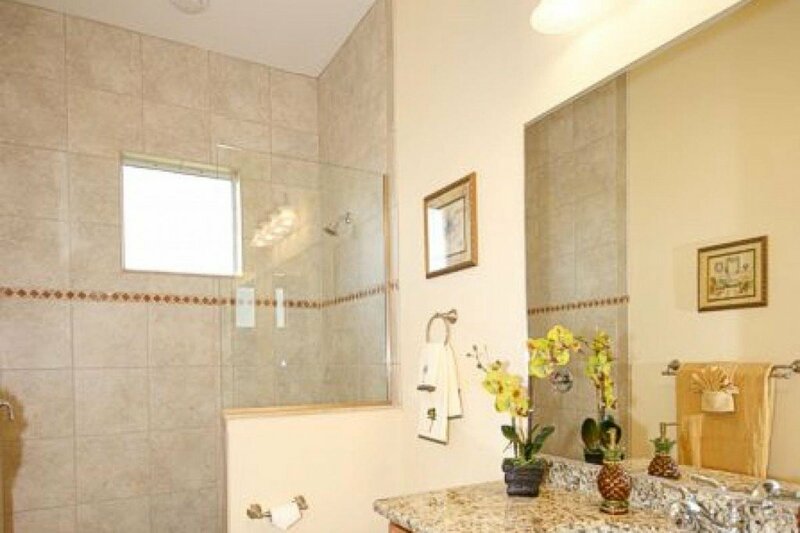 The other master suite also has a King size bed and a walk-in shower. 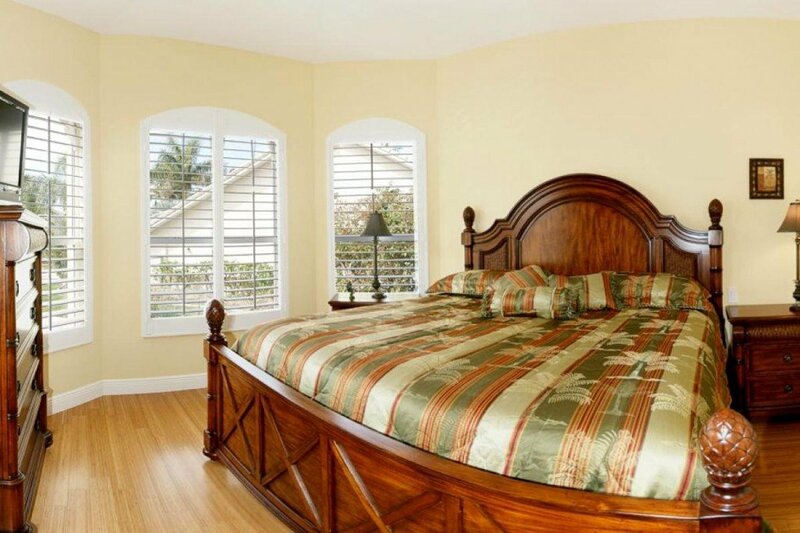 The “Bahama Room,” the third bedroom, offers another King size bed. 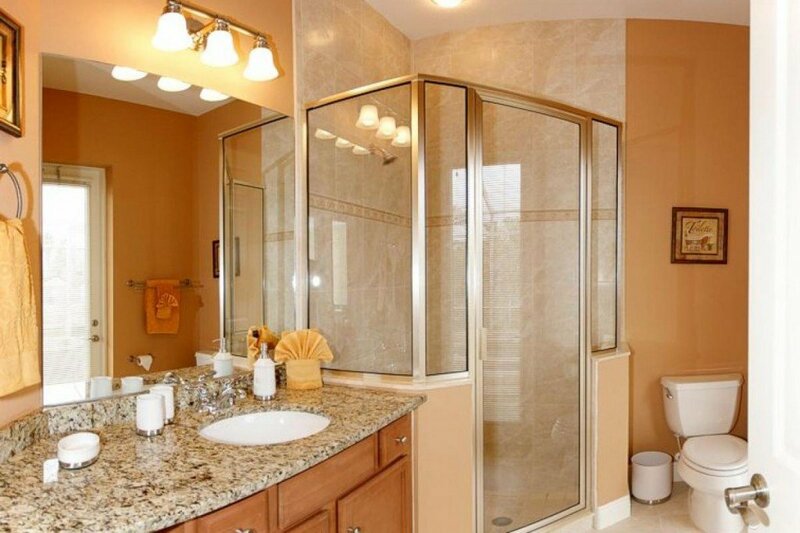 The bathroom features a walk-in shower as well. 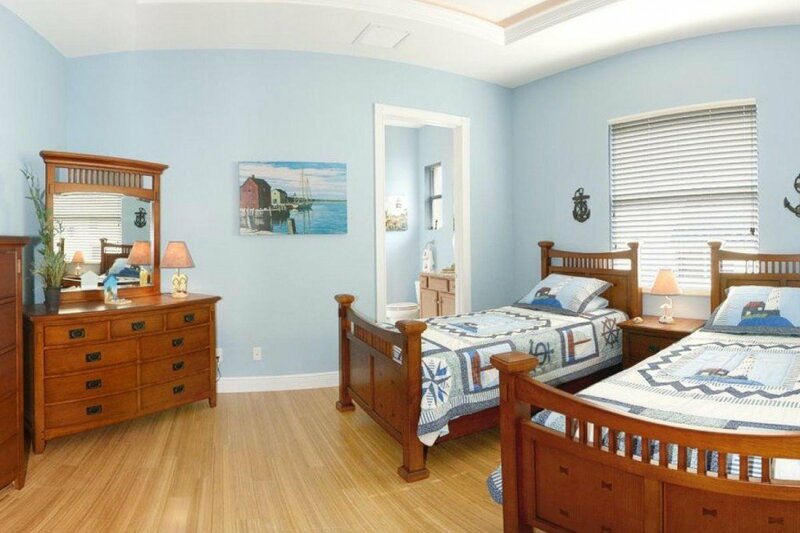 Two Twin beds can be found in the fourth bedroom, the “Lighthouse Room.” Again, the bathroom was designed with a walk-in shower. Guests will enjoy the spacious living room with its comfortable sofa and chairs. 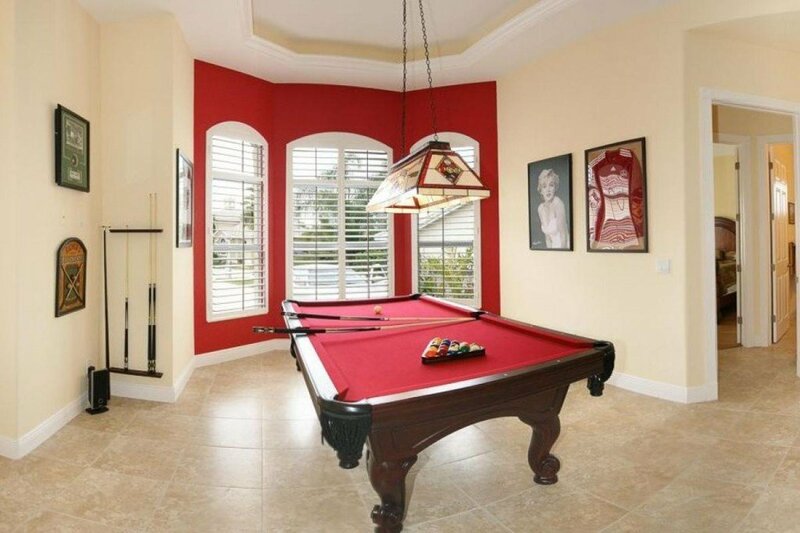 A competition-size pool table will allow for hours of fun, and if you bring your i-pod, you can hook it up to the stereo system. 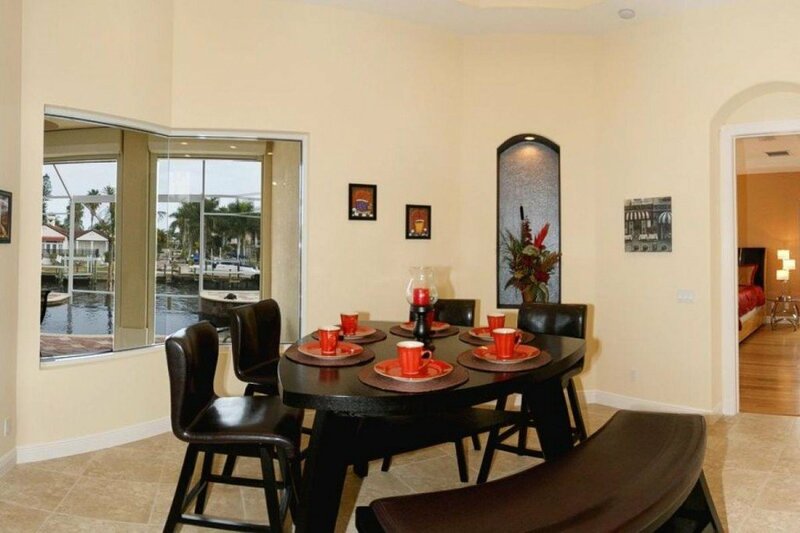 The open dining area and kitchen complete this area. Fully equipped, the kitchen includes a large refrigerator with ice maker, stove, microwave, juicer etc., also plenty of dishes and silverware. Linens and towels are provided, plus a washer and dryer. 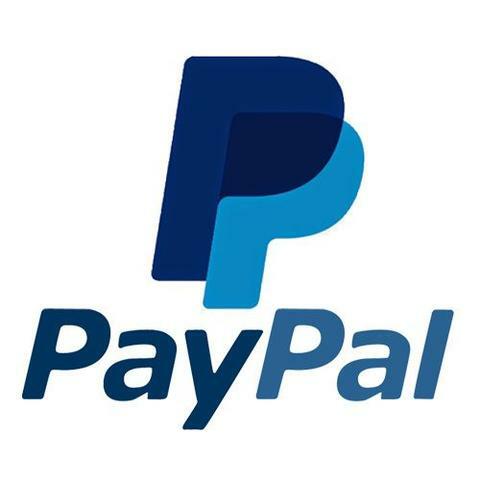 High speed internet access is available at no extra cost. The pool area is perfect to enjoy a sunny vacation day. 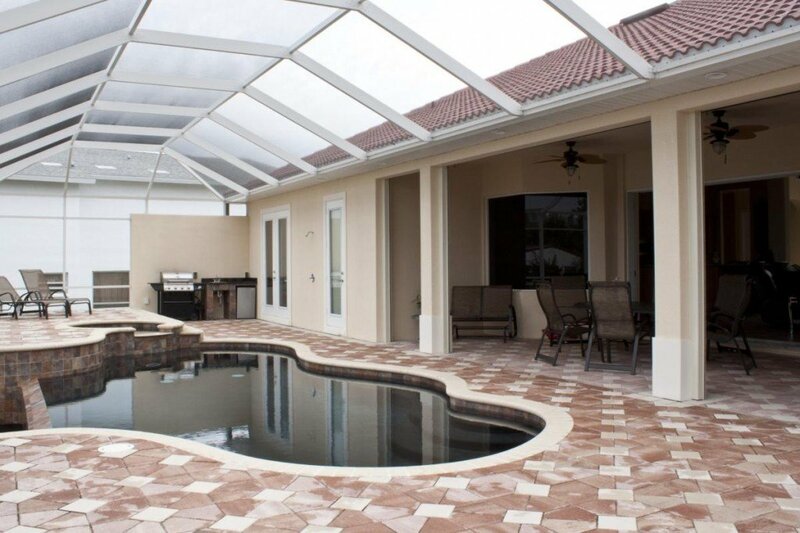 To the left and right of the pool, two sundecks with lounge chairs invite guests to relax for hours. You can end the day with a great BBQ on the summer kitchen. There is even a TV on the patio.